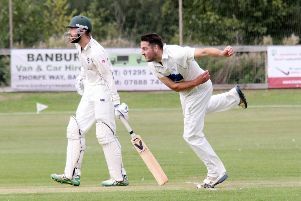 Lloyd Sabin signed off with a superb century but it was not enough to save Banbury from a final day defeat in the Home Counties Premier Cricket League. Banbury lost by four wickets in Saturday’s final fixture at Finchampstead, where wicket-keeper Shazad Rana took his 23rd catch of the season - a new club record. Having elected to bat, the Banbury captain saw Tom Bartlett caught by Andrew House off Darron Augustus for 13 before he joined Craig Haupt in the middle. Sabin and Haupt put on 85 runs for the second wicket before their partnership was ended. Haupt was trapped lbw by Josh Lincoln for 28 and Oliver Clarke soon followed. Sabin put on 100 runs for the fourth wicket with Richard West who was caught by Simon Bell off Augustus for a quick-fire 62 runs off just 69 balls which included four boundaries and a six. Sabin was finally caught by Scott Osler off Zafar Ali for 127 off just 129 balls which included 12 boundaries. 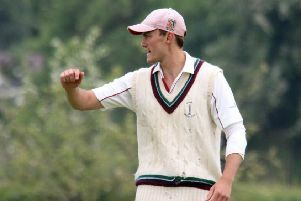 Charlie Hill was caught by Bell off Ali for 21 runs as Banbury posted 268-6 from their 50 overs. In reply, Banbury made the early breakthrough when House was caught by Hill off Olly Wright and fellow opener Tommie Predgen was trapped lbw by Graham Beer	as Finchampstead were reduced to 9-2. But Gregory Smith put on 132 runs for the third wicket with Simon Bell before he was caught by Beer off James Curtis for 63 runs off 74 balls. Augustus soon followed but Bell and Josh Lincoln got Finchampstead back on track as they edged closer towards the target. Ryan Quinn was bowled by Clarke for 64 runs off only 47 balls as Finchampstead found the required runs in the penultimate over with Bell remaining unbeaten on 102 runs off 125 runs which included eight boundaries.